Mickey and Minnie Mouse. These glass panels will always look great! 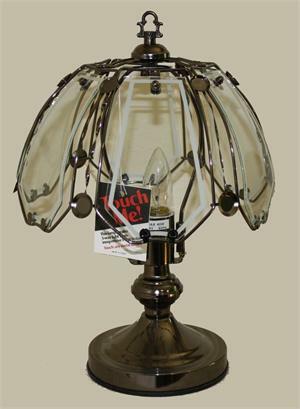 This table lamp has a 17” height and is 10” wide. The touch sensor gives you 3 light level settings with only a touch to any metal part of the lamp. The brass finish looks great with only minimal care. (Care instructions with lamp.) Changing your light level is as easy as 1-2-3. One touch on the metal gives you the lowest light level, a second touch gives you medium light and a third touch sets you lamp to its highest level of light. A final touch turns your lamp off. All of this is done with a regular light bulb, up to a maximum of 40watts. This lamp uses 1 regular light bulb. The sensor that makes all of this possible is covered by a one year warranty. Simply return the sensor to us for a replacement within one year. Touch sensors are also available for purchase.